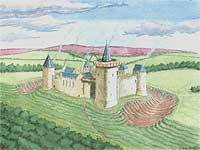 These castles are ones that have appeared on web sites elsewhere but disappeared. publishing them once again. Information will be added in due course. The castles in England have the common factor of having been attacked by Scots at one time or another.